It comes to my attention that a lot of people are having issues on syncing iPads, iPhones and iPods with iTunes. It would seem that even though the device is set up to sync with iTunes correctly, sometimes it just feels like being a jerk and not syncing. I noticed that many iPhone users were talking about the same question: “Why aren’t some of the songs transferred to my iPhone?” In this article, there are some solutions that is helpful for fixing the problem of iTunes music not syncing to iPhone. And hoping that they will work for you. Analysis: Some people switched their old iPhone to the new iPhone 7 but don’t know how to sync their music stored in iTunes to the new iPhone. Or people backed up their music with iTunes when updating to iOS 10, and they need to recover them from iTunes to their iPhone. The post will give iPhone users some advice to fix iTunes Music Not Syncing to iPhone. 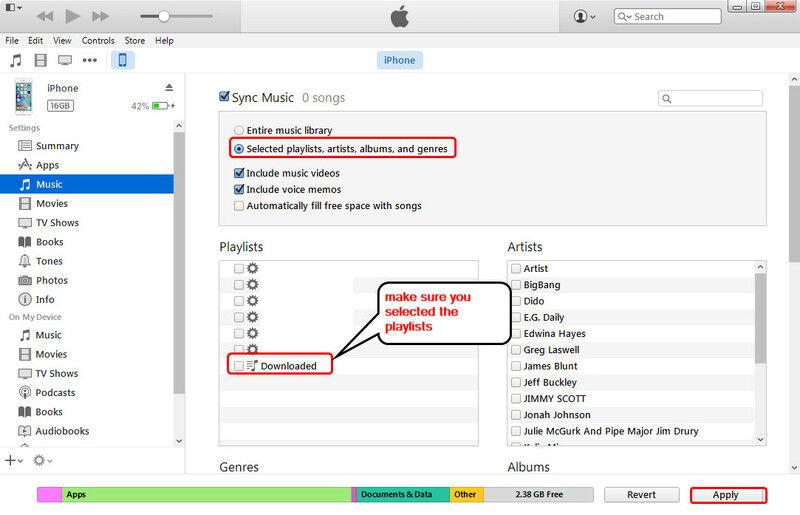 As the official tool released by Apple, iTunes can help users to sync music from iTunes to iPhone. User can choose to sync entire music library. The following guidance will show you how to transfer music from iTunes to iPhone with iTunes. Step 1.Run iTunes and connect your iPhone to your PC. Once the iPhone appears in iTunes, click on it. Step 2.Click the “Music” library on the left sidebar of the interface and check the “Sync Music” option. Step 3.Select the “Entire music library” option. Then click the “Apply” button. Now iTunes will begin to sync music from iTunes library to your iPhone. And you may get the “Remove and Sync” prompt, this means that iTunes will remove any songs or playlists from your iPhone if you didn’t yet sync the iPhone with the iTunes library on this PC. Analysis: Have you ever met the similar situation after updating to iOS 9.3? You can pick up the whole playlist to transfer, but some of music files just grey out after being transferred to your iPhone, and they can’t be played at all. You may have tried several ways to fix this problem, but still got no luck. Then how will you transfer music from iTunes to iPhone without losing any song? Since you are still able to find out which songs are not transferred, you may have an easy-to-go method to fix the problem. Step 1. Launch iTunes on your computer. Click “Edit > Preferences > Device”, and check “Prevent iPods, iPads and iPhones from syncing automatically”. Step 2. Plug iPhone into computer with the USB cable. Then the iPhone will be shown in the left sidebar. Click the name of your iPhone, and choose “Music” in the summary panel. Step 3. Check “Sync Music” and “Selected playlists, artists, albums, and genres”. Then the playlists you created in iTunes will be shown below in the window. Step 4. >Choose the music files that are OK to transfer to iPhone, and click “Apply”. Then iTunes will sync those songs to your iPhone. If the music files that cannot be transferred are purchased items, you can check the Apple ID that you use in iTunes Store and on your iPhone. If the Apple ID is not matched, the music may not be synced with iTunes. If you are adding songs from computer to iPhone with iTunes, you may want to check whether the original music files are still available. Maybe the original music files on your computer are deleted, so you can’t transfer the music files to iPhone. The deleted or lost songs are marked with exclamation in the iTunes Library, and you can easily find them out. Another situation is not common but it does exist. 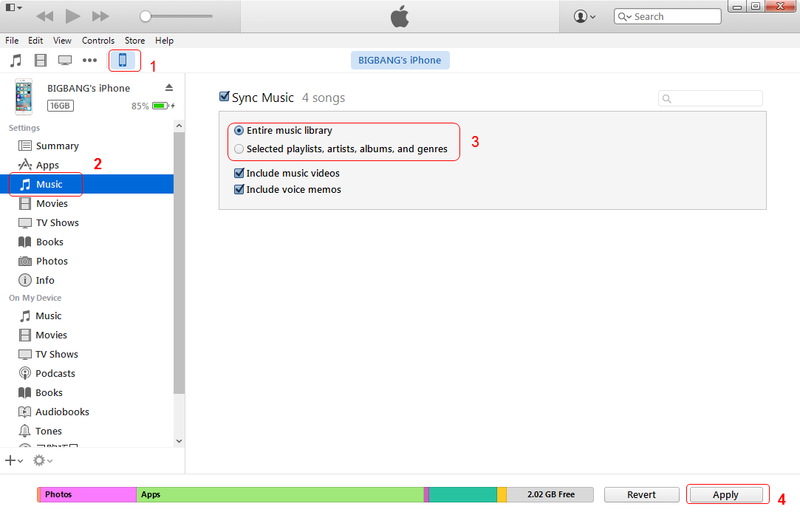 The syncing process is complete with iTunes, but the music files are not transferred to iPhone. At this moment, you can get access to your iTunes on your iPhone, and find “Not on this iPhone” at check it. Then iTunes will start downloading the music files that are not transferred. This trick is helpful but only for the purchased music files. If you want to get rid of this troublesome situation, I would like to introduce you easy-to-use iPhone transfer software – Leawo iTransfer. This software is used for transferring files among iOS devices, iTunes and PCs, and it enables users to transfer apps, music, movies, TV shows, ringtones, ebooks, photos and Camera Roll without the sync of iTunes. If you want to transfer music from iTunes to iPhone, Leawo iTransfer is a good choice. You can check out the following guidance, or free download the software and have a try yourself. The trial version has limited transfer times. Step 1.Run Leawo iTransfer and connect iPhone to computer with the USB cable. The software will automatically detect the libraries of your iPhone. Step 2.You will see the iTunes library is below the libraries of your iPhone. Choose the “Music” library of iTunes, and the contents will show up in the right part. Click the transfer button at the right bottom to transfer all the music to your iPhone; or hold “Ctrl” key and click to choose certain music files, then right-click the selected music to “Transfer to > iPhone”. Step 3.After choosing files, you will see the pop-up dialog of transfer settings. Check “Transfer to List: iPhone” in the dialog, and then click “Transfer Now” at the right bottom to start transferring music from iTunes to iPhone. Apart from transferring music from iTunes to iPhone without any data loss, Leawo iTransfer is also helpful for transfer other files among iOS devices, iTunes and computers. For example, you can transfer music from computer to iPhone without iTunes.